This is adorable! Love it. Very sturdy and no fading. Liked the first one so much that I order another one for my back door also. 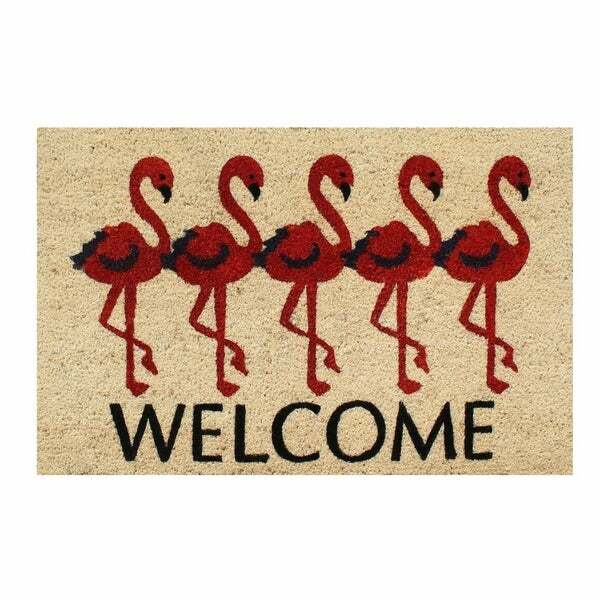 Happily welcome guests with this vibrant Flamingo Welcome Mat. Constructed out of natural coir, this mat is extra durable and features an anti-skid vinyl backing for extra strength. Recommended for outdoor/indoor use in covered areas. Vacuum or shake the mat regularly for longer life. I bought this for my apartment in Malibu, and love it! It's a fun way to welcome myself home! Just what I was looking for. I live in a condo so I didn't want anything too outrageous. But I love flamingos and this fits the bill! Perks up my front porch and says "hello summer"! Great gift. My children loved it. I was supposed to get a 21% discount from PayPal but didn’t!! !